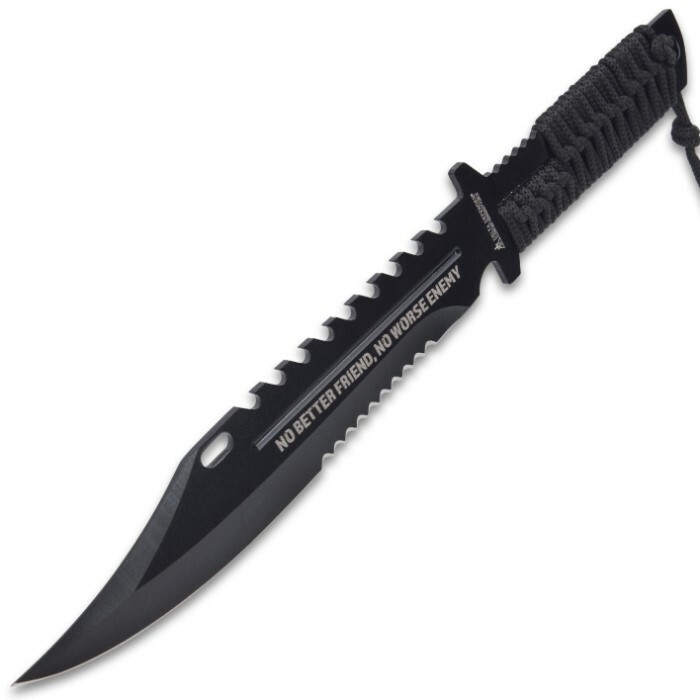 Cord Wrapped Double Serrated Survival Fixed Blade Knife | BUDK.com - Knives & Swords At The Lowest Prices! This brand new survival fixed-blade knife features powerful saw tooth serrations on the blade and a heavy sawback spine. 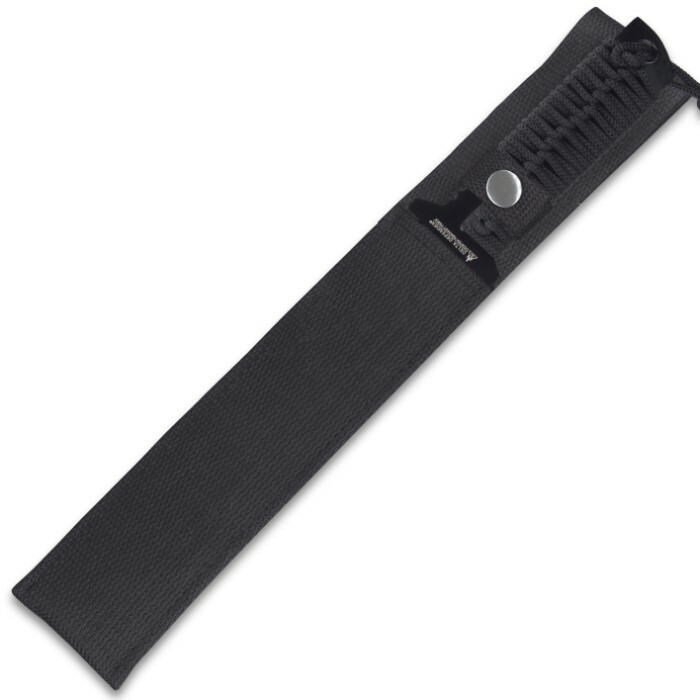 The single piece of steel features a non-reflective, anodized black coating and nylon cord wrappings on the handle. Store and carry it in the nylon sheath. I just received my knives and they both are RAZOR SHARP right out of the box so be very careful. I ran the blades down my arm and they took the hair off easily. I could shave with them if I wanted to. They are very well built and easy to hold. I sliced through 4 paged of a magazine without a tear. This such a great knife. Comes out sharp out of the box. Gonna buy two more. GReat knifes for great price Sharp as Hell right out the Box, i am able to shave with this knife! Pretty good knife for the price, especially since I got it BOGO. Blades are a little lightweight but are sharp. Nylon sheath is heavy duty but to narrow and tight around the blade. Inserting and pulling the knife (sharp blade) will cut through sooner than later. Will also have to see how long before the cord unravels like other cord wrapped knives. Also should have wrapped the whole handle instead of leaving the short corrugated section exposed - would be uncomfortable when gripping hard. It is a great knife, bought it on the bogo sale and I really do love it! From the price I paid to what I got it is amazing. Some recommend getting a thicker cord and re-threading it, but the threading is really great as well as the cord. One thing that could be better about the whole thing overall is the sheath. Everything else is amazing!